I love fall for many reasons; bright orange leaves, crisp breezy weather, big Halloween pumpkins, and the amazing apple fritters sold at the cider mill down the road. Drool. I have to limit myself to only a half-dozen per season or who knows what might happen. 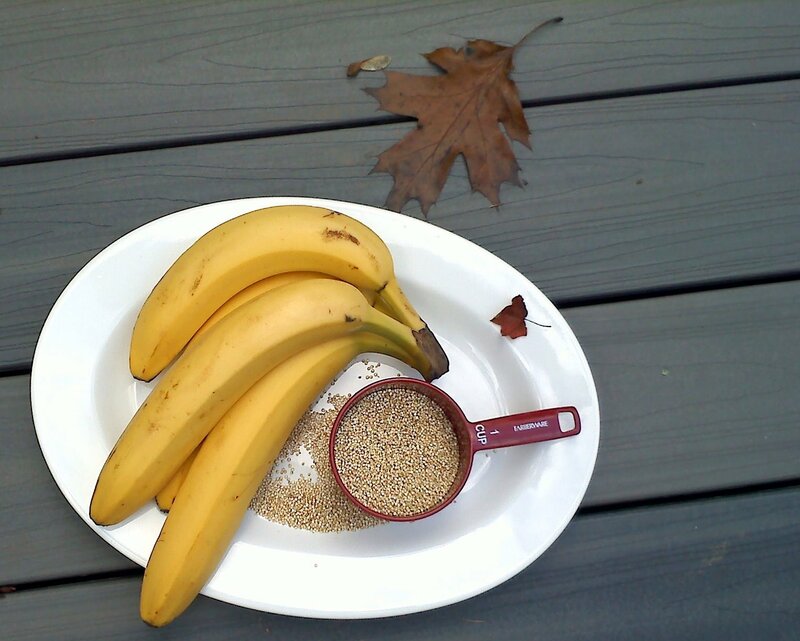 This morning I remembered another (healthier) reason that I love fall – porridge. Just the word porridge makes me feel all warm and cozy! It conjures images of a roaring fires and fuzzy socks. I rarely eat hot cereal in the summer months, but come fall, I start to crave a comforting bowl of chewy, nutty goodness. And quinoa makes for an extra nutty porridge, not to mention an extra nutritious breakfast. Chock full of vitamins and protein, this is the real breakfast of champions. If you haven’t jumped on the quinoa bandwagon yet, breakfast is a good time to do so. The quinoa makes for a great texture here. 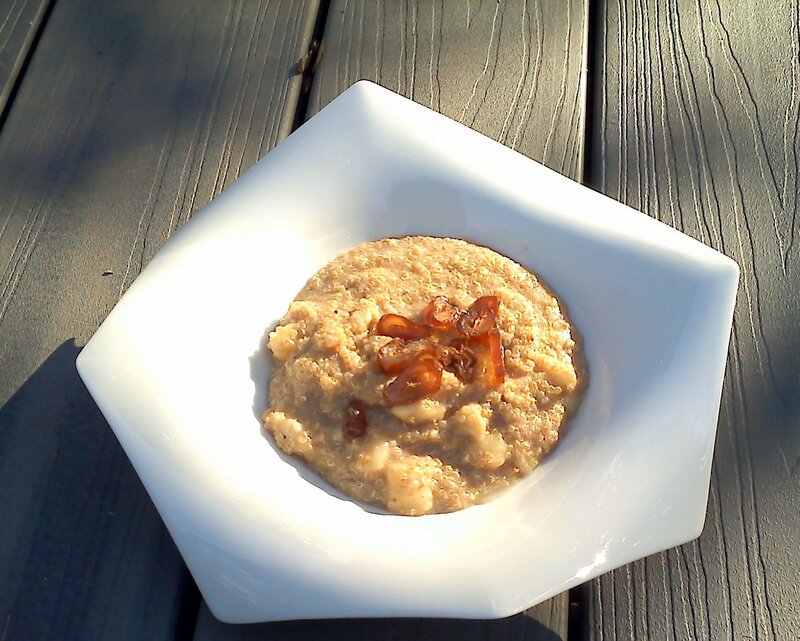 With oatmeal, grits and rice pudding I often feel the need for a bit of crunch, a few nuts or a sprinkle of granola. But the quinoa provides such an interesting mouthfeel and so much robust flavor, that I find nuts unnecessary. Even so, some toasted almonds would be lovely sprinkled on top. So would flaked coconut. I went for a bit of extra sweetness with the chopped dates, but the possibilities are endless. And if two bananas for two servings sounds like a lot, well, it is. But trust me. Sweet silky bananas and fluffy, chewy quinoa are an alluring combination. In a small saucepan, bring the water and almond milk to a simmer. Stir in the rinsed quinoa and the spices and reduce the heat to medium-low. Cook, stirring every so often, for about 15 minutes. Add in the chopped bananas and cook, stirring, until most of the liquid is absorbed and the bananas chunks begin to break down. Spoon into two bowls and top with the dates, if desired. Serve hot. I woke up this morning with my fingers itching for a rolling pin. This sounds strange, I know, but dough relaxes me. I figure that taking out my stress and aggression on flour and butter must be healthier than some other vices (unless, of course, I eat all of the pastry, which has been known to happen). It has been a while since I actually made puff pastry by hand since frozen puff pastry works perfectly in most recipes. But sometimes, like today, it’s about the journey, not the destination. I used Rose Levy Beranbaum’s puff pastry recipe from The Pie and Pastry Bible as a guide with some small tweaks. Actually, she features two recipes – one of which uses the food processor to do most of the work. I’m sure that this quicker version produces just as lovely a result, but I’m an all or nothing kind of gal, and would rather do it by hand or just buy it frozen. In any case, puff pastry and the methodical folding, rolling, and folding again required for the flakiest dough appealed to me this morning. I love that such a decadent product is the result of simple ingredients; flour, butter, salt, water, and lemon juice. That’s it. So, of course, the quality of each and every ingredient counts. French butter, with its lesser water content, certainly produces the flakiest pastry (for more on French butter, take a look at Dorie Greenspan’s explanation). But I had only regular unsalted butter in my refrigerator, which actually worked just fine. I often use puff pastry to make cheddar cheese straws, or cut rounds of it to form the base of smoked salmon canapés. But this morning, I went for something sweeter. Jeff is not much of a breakfast fan, nor does he generally like sweets, but he adores cheese danish. 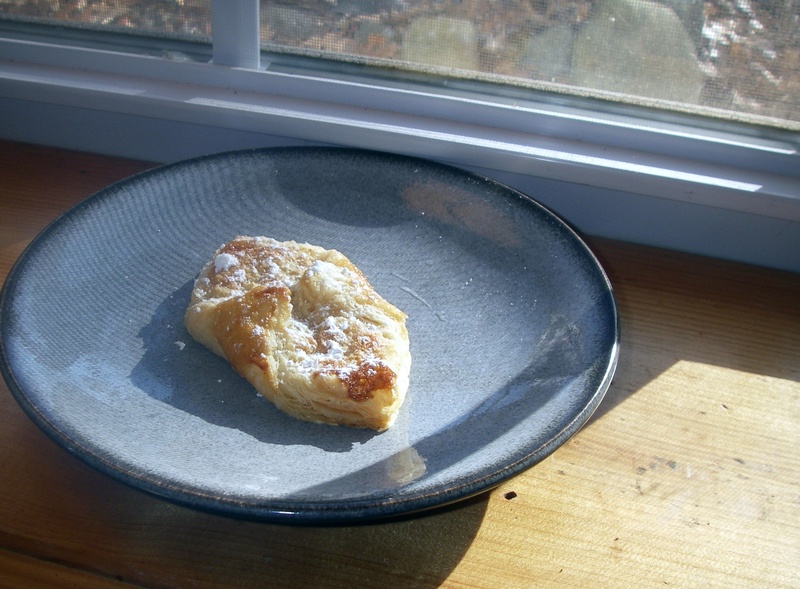 And while danish pastry is traditionally made with a yeast dough, puff pastry is an excellent stand-in, and what I always used when making danish at the Bed & Breakfast. These treats are surprisingly light, despite the rich filling, and with a dusting of powdered sugar are just sweet enough to be the perfect companion to my morning latte. And since they don’t keep well, I feel no guilt whatsoever at having eaten two of them! Cut 3 tablespoons of butter into small pieces. In a mixing bowl, rub together the 3 tablespoons of butter, 11/4 cups of the flour, and the salt with your fingers until no butter lumps remain. Add in lemon juice and 8 tablespoons of water, one by one, stirring with a fork to form a soft, shaggy dough. If the dough is still very dry, add remaining water by the tablespoonful. Knead the dough on a floured surface until it holds together. Wrap the dough in plastic wrap and refrigerate for 20 minutes. Meanwhile, place the remaining cold butter, cut in large chunks, and remaining flour in a sealable plastic bag. Knead together the butter and flour through the plastic. Once most of the flour is incorporated, turn the butter out onto a floured surface and, working very quickly, shape the butter into a square about 4 inches by 4 inches. Wrap the butter in plastic wrap and place in the refrigerator while you roll out the dough. 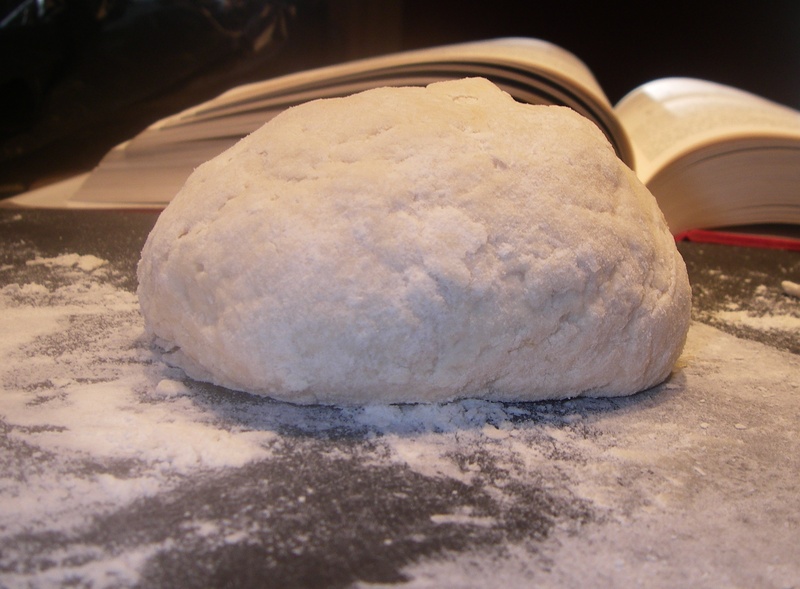 Take the dough out of the refrigerator and roll out on a floured surface to a large rectangle. Place the butter square in the middle on the dough. Fold each corner of dough to the middle (if the corners don’t meet and cover all of the butter, remove the butter and roll the dough out into a larger rectangle). With the butter inside the packet, roll the dough again into a rectangle, about 6 inches wide by 12 inches long. Fold the dough in thirds like a letter and roll again into a 6 inch by 12 inch rectangle. Repeat this process one more time and then wrap the dough in plastic and refrigerate for 20 minutes. Take the dough out of the refrigerator and repeat the folding and rolling three more times. At this stage, the dough may be used or can be frozen. Beat the cream cheese, sugar, egg yolk, and vanilla on low until smooth. 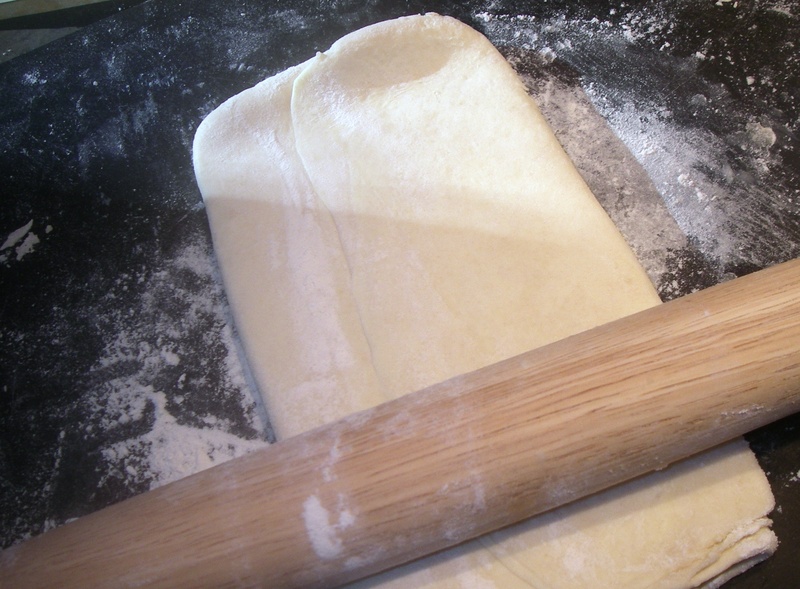 Roll out the pastry dough on a floured surface to a square about 12 inches by 12 inches. Cut the square in half horizontally and then cut each half twice vertically to create six rectangles. Place a heaping tablespoonful of the filling in the center of each rectangle, and fold two opposite corners of the pastry to the middle, pinching them together over the filling. Brush the danish with egg wash and place on a lightly greased baking sheet. Bake for 20-25 minutes until lightly browned. Let cool slightly and dust with powdered sugar.